The most successful sports car in the world, the Porsche 911 model line has seen more than 820,000 vehicles built since its inception in 1963. 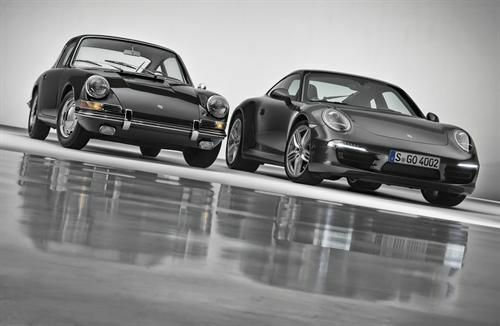 To celebrate those fifty years, Porsche is planning a series of anniversary events throughout 2013, including a dedicated exhibition at the Porsche Museum in Stuttgart. The 911 is the head of the Porsche brand and has been since the debut of the first model, the 901 at the International Automotive Show in September of 1963. It didn't take long for the Porsche 911 to be considered the benchmark sports car that other European automakers strove to beat. In the automotive press, the 911 is the most-often referred to comparison vehicle for other 2-seat sports offerings. Porsche itself often compares its other models to the base model 911, referencing the iconic car when discussing the Cayenne, for example, to describe its handling or capabilities. Internally, Porsche compares its production designs with the 911 as the company strives to keep its vehicles to a high standard of sportiness. To celebrate the car's half-century of excellence, Porsche will be hosting several events throughout 2013. Kicking it all off will be the Retro Classics auto show in Stuttgart on March 7th which will in turn launch the Porsche Museum's new special exhibits. The Museum will showcase an early-model 911 Turbo Coupe, a 911 Cabriolet study from 1981, a 1997 road-going "street" version 911 GT1, and a pre-series Type 754 T7 - whose chassis was a milestone in Professor Ferdinand Alexander Porsche's design of the 911. An authentic 1967 model 911 will be going on a world tour as well. Over the course of the year, this classic will travel to five continents to showcase at Concours and similar classic shows around the globe. It will be seen by the public in Pebble Beach, California, at Goodwood in the UK, in Paris, Australia and China. It will be shown at rallies, fairs, and motor events and can be followed virtually at porsche.com/follow-911 once it begins its tour next month. Finally, in June, the Porsche Museum will begin a 50 Years of Porsche 911 exhibit featuring the history of the development of the 911, including a printed Edition Porsche-Museum anniversary book titled 911x911 available for purchase at the museum and at select bookstores internationally. Follow the Porsche 911 celebrations at origin.Porsche.com.